After graduation, Sheridan began her career as a Young Adult Services Librarian at a large regional public library in Fresno, CA. She planned and implemented programs for teenagers, participated in collection development, helped manage the library’s social media pages, and worked with the general public on a daily basis. After a short time in the position, Sheridan started a personal Tumblr blog page called “I Work at a Public Library,” where she could share funny moments, heartwarming tales, and photos of oddities found in the library. “The strange little things that happen in life have always intrigued and delighted me, and the blog was a way for me to collect these moments,” Sheridan says. Soon other librarians took notice and started sending Sheridan their own library stories. In 2013, a literary agent contacted Sheridan via Twitter and because of that surprise encounter, the project morphed into a book – I Work at a Public Library: A Collection of Crazy Stories from the Stacks (2014). 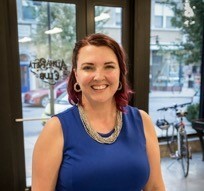 By the time the book came out in 2014, Sheridan was already working as a branch manager at a library in her hometown of St. Louis, MO where she now leads a team of 17 people. Soon after, the publisher asked for more, and in 2015, Sheridan released her personal stash of favorite stories in a book of recommendations called, Check These Out: One Librarian’s Catalog of the 200 Coolest, Best, and Most Important Books You’ll Ever Read.